Living things evolve, dead things can be remembered but extinction is normal. I have no objection to expressions of regret, but I find the hand-wringing and sanctimonious claptrap about the extinction of species, languages and cultures illogical and without thought. 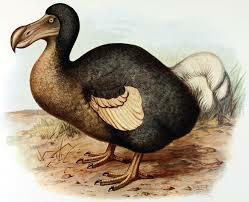 I don’t miss the dodo or any of the dinosaurs. I don’t miss Latin or Sanskrit (even though I had to sit through boring lessons in both). It is only a natural course of development that isolated Amazonian tribes have disappeared as their members have joined the rest of the world. I don’t miss the cannibalistic cultures which have disappeared. The recent splurge of nonsense about the “death of the last known male, northern white rhino” was a case in point. It may be a matter of some regret that this particular individual died a natural death, but the end of an unfit sub-species of rhino is not an event requiring the mawkish sentimentality that flooded the media. Species evolve to survive or they go extinct. Languages evolve and they die when they are of no use to anyone anymore. Cultures evolve and merge with other cultures or they try to remain separate as a distinct, (often racial) identity by isolation and inevitably they die out. The cultures that disappear don’t survive because they are not viable in the world they live in. Regret is one thing, but trying to artificially protect non-viable species, languages or cultures or peoples by putting them in a “zoo” is mawkish and irrational and, ultimately, unethical. Keeping backward tribes isolated to “preserve” their cultures and freezing them into backwardness (by preventing them from merging or being absorbed by the world) is immoral. Freezing individuals from unfit species in a zoo, and neither helping them to evolve nor allowing the species to go extinct, is immoral. Preserving dead languages is of academic interest and does not prevent the extinction of languages which no longer serve a useful purpose. To the best of our knowledge there are about 7,000 languages recognised today. Depending upon when language began (between 50,000 and 200,000 years ago) between 90 and 99% of all languages are now extinct. Written languages are much younger of course. An extinct language is a matter of history. Some languages evolved and produced versions still in use today. Others did not. We know about some of these because they developed writing and left some records which have survived. Languages die a natural death when they stop being used. Of course there is nothing wrong in speakers of dying languages trying to revitalise them. Governments have sometimes tried to promote particular languages (French, Hindi), and sometimes to suppress some (Welsh, Sami). Languages have been invented (Esperanto or Klingon). Most of these attempts of artificially creating, protecting or suppressing language are futile. The ultimate arbiter of language (and of grammar and of spelling) is usage. The real question should not be whether a language is “endangered” and should be protected but whether a language serves any useful purpose. If it does, it will survive. If it does not, it should not survive. Endangered languages should be recorded for history and allowed to die in peace. We don’t know how many species are alive today. Estimates have ranged from 10 million to 14 million, of which over 86 percent have not yet been described. A 2016 study even concludes that Earth currently has 1 trillion species. Whatever the actual number, what is known is that over 99% of all species that ever existed are now extinct. By the time a failing species is formally considered to be endangered, it is almost irrelevant to the ecological system it is embedded in. Tigers, as an example, are restricted only to areas of captivity (whether zoos or reserves). Even in some reserves where they are nominally free, the species is of no great significance to the bio-system. A species may well be going extinct because it is losing habitat to humans, but that in itself is a failure of that species. Some species are adapting to man, but where conservationists intervene to “protect” species they always do so by freezing the species into some form of captivity. They never try to help that species to adapt genetically to survive in its new environment. This form of conservation may be emotionally satisfying for humans but is of little consequence in the sustainable survival of the endangered species. Evolution produces far more failed species than successful ones. The detritus of evolution needs to be cleaned out from time to time. A mass extinction is one way to muck out the evolutionary stables. Currently there are too many species surviving and around 30% probably need to be washed away into extinction. As with language and species there is much energy and misguided thinking expended in the protection of “indigenous peoples” and outdated, non-viable cultures. Much of this “protection” is about “freezing” these humans and their cultures into unsustainable conditions in what are effectively human zoos or reserves. The long term survival of tribes and indigenous peoples is by them joining or being absorbed by the mainstream or of reaching a critical mass such that they can have an autonomous survival. Genetic isolation (or genetic purity as practiced by some groups) is not sustainable in the long term. The Sentinelese are still apparently in the “stone-age” and both isolated and captive. Is it better (for whom?) to allow them to remain isolated and doomed or to bring them into the mainstream which would effectively eliminate them as a separate but backward culture? Extinction is normal for peoples, languages, cultures and for species. To struggle against extinction is just a part of survival and also normal. But when extinction does occur, it may be a matter of regret and even of sorrow, but it is normal and morally neutral. But “conservation” by freezing language or culture or species or peoples into a “failed” condition is immoral. Species, like an ideal gas, expand to fill the space available to them. Most species – so far -have had a life of less than 10 million years though some (the living fossils) may exist for hundreds of millions of years. More species have become extinct over the years than are in existence today. It is stated that over 99% of all species that have ever existed are now extinct. The death of a species is nearly always due to competitive pressure from other species or by a change in their surrounding conditions that the species fails to adapt to. There have been at least 5 so-called mass extinctions over geological time — though in each case sufficient species remained so that evolution and development could continue in new directions. If the dinosaurs had not become extinct then man would probably never have evolved. If man ever does become extinct then it will surely provide the room for the possible development of some other species. Any strategy to try and “guide” the future development of humankind must – it seems to me – include for the expansion of the species and cannot be based on the stagnation of the species. It is inevitable that less successful species will die out in the face of this competition. To merely conserve a species to continue its existence in a Zoo (and there is no nature reserve or wildlife park which is not ultimately just a zoo) without any room for the development or growth of that species may satisfy some deep seated aesthetic, human urge, but it is of no significance in terms of development of either the species being protected or of the human species. Why then is there so much fuss about the possible extinction of some current species today? Intentionally terminating a species merely for the sake of terminating that species ought then to be “wrong”. And so it is; except when mankind perceives that the quality of life of the human species is jeopardised by the existence of that other species. There are no qualms therefore in the eradication – or the attempted eradication – of parasites, viruses, bacteria or the tsetse fly or certain types of mosquitoes. That it is desirable that tigers and lions or other species that are threatened by competition with humans continue to exist, is driven primarily by aesthetic values. If human aesthetics desire the preservation of such species in reservations, then that is perfectly allowable. But such “protected” species are effectively frozen in time and have no space for expansion or evolution. They are effectively removed from being active contributors to the “web of life”. Furthermore the dependence of man as a species on the diversity of other existing species is decreasing. As we increase the use of IVF, or genetically engineered crops, or animal-cloning or selective animal breeding programmes, the dependence of mankind on the ad hoc food-chains that exist is reduced. (I observe that the use of the words “natural” or “unnatural” here are meaningless. The intervention of humans in any “natural” process is not more “unnatural” than breeding cows or creating over 200 breeds of dogs. Since humans are part of “nature” then anything humans do is – by definition – “natural”). As drugs – which may have first been extracted from some particular plants – are synthesised and tailored to meet human needs the dependence upon the plant species disappears. The objectives of the Biodiversity conference currently being held in Nagoya are the most inconsequential platitudes which are irrational, unscientific and merely exhibit a “woolly” sentimentality. What is not addressed at all is why the conservation (or more correctly the stagnation) of biological diversity is something to be desired and by which species. I take it as axiomatic that the ultimate beneficiary must be the human species – if not necessarily individual humans. (Here too I would observe that it is by ensuring benefits to individuals that we shall probably do the greatest good for the species). The conservation of a species for the sake of conservation is just as wrong as the extermination of a species for the sake of extermination. As demographic pressures and consumption levels increase, biodiversity decreases, and the ability of the natural world to continue delivering the goods and services on which humanity ultimately depends may be undermined. This would imply an acceptance that other species exist only to serve the human species. The conclusion then must be that if a species does not contribute to the supply of goods and services for man then it is redundant as a species. If such a redundant species becomes extinct it may be aesthetically displeasing but it is of no consequence for the advancement of the human species. The second objective “the sustainable use of the components of biodiversity” then means that as human ingenuity and intervention ensures the supply of goods and services needed (whether by farming techniques or fish farming or cattle and poultry breeding or by synthetic techniques), then other species which were contributing to such supply become redundant. The 3rd objective regarding “fair and equitable sharing of the benefits arising out of the utilization of genetic resources” has really nothing at all to do with the diversity of species and instead is an issue of distribution of the benefits of exploiting other species. For example, it is the issue of drug companies from developed countries extracting medicinal materials from plants only found in developing countries and of ensuring that monetary benefits also find their way to the country in which the plant grows. But once the medicinal materials can be synthesised the plant – as a species – becomes redundant. Sometimes it is claimed that biodiversity is needed to maintain the gene pool. But to what end do we need this gene pool where genes do not cross species boundaries? This makes no sense unless one is trying to ensure the evolution and development of replacement species once humans are extinct. It is also claimed at times that we know so little about the various interactions between species that it would be dangerous to allow any species to become extinct. But this is mere alarmism. Focusing on real benefits to humans in need of food or medicine or water or space would be much more constructive than harping on “not doing something” for fear of unknown and unquantifiable dangers. The COP10 conference in Nagoya seems to be going the way of the Copenhagen climate conference in 2009 – and that is probably a very good thing. That the success of humans as a species is reducing the habitat for and the viability of other species is obvious. That this is “unnatural” or undesirable is nonsensical.